Make a Shirt Into a Pillow! 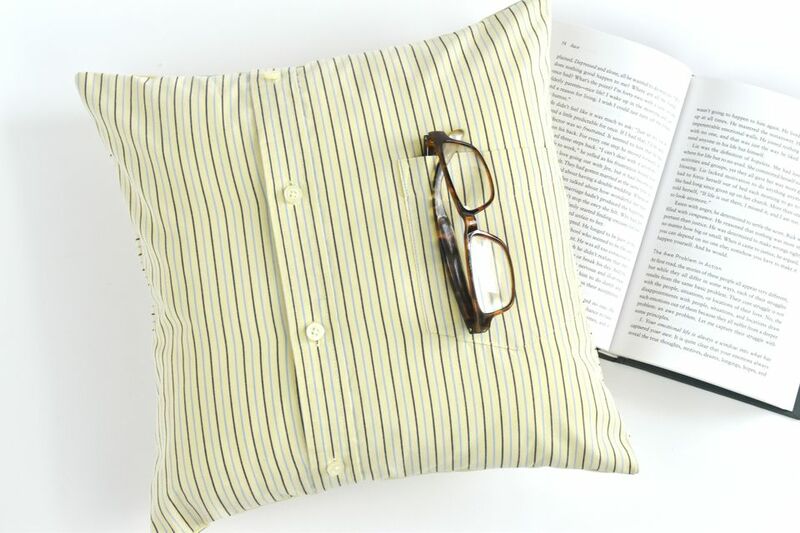 Dress a pillow or two for success with this DIY shirt pillow cover! You don't need to sew a single zipper or even make an overlapping back, because the built-in buttons do all the work for you. This is a great way to upcycle an old shirt and make it into something new. And since you only need part of the shirt, you can use the rest of the fabric for other small sewing projects, such as pincushions or small pouches. This project can work with most adult shirts, but it's easier with larger shirts. The more fabric in the shirt, the more options for placement and cutting. Larger shirts also give you the option to use a larger pillow form. For the sample pillow, the shirt is a men's large and the pillow is 14 inches. It's also best to use a shirt without darts or shaping. These elements would change the way the cover fits on the pillow. The front and back of the pillow cover need to be one inch larger than the pillow form. For example, with a 14-inch square pillow, the fabric should be 15 inches x 15 inches. With the shirt fully buttoned, use your ruler to visualize how to cut the front piece. If the shirt has a pocket, try to keep the entire pocket on the pillow front, plus about an inch to the side. Depending on the size of your pillow, you may be able to center the button placket. But you can also make it off-center. Try to leave at least one inch from the buttons at the top and bottom. Mark where you need to cut out the shirt front. It's possible to cut through both the front and back at the same time, however, you're more likely to end up with uneven or crooked pieces. Instead, cut the sides so you can open the shirt while keeping the front buttoned. Use the rotary cutter and ruler to cut the front piece, then cut the back to match. You may find that you want to cut the back square lower than the front so you can avoid the yoke. Cutting the back separately is also helpful if you want to match any stripes or other patterns on the shirt. Pin the front and back of the shirt pillow pieces with right sides together. Be sure to pin the button placket, keeping the layers aligned. Sew around all four sides with a 1/2-inch seam allowance. Back stitch over the button plackets at the top and bottom for reinforcement. Trim the corners to reduce bulk. Reach through the button placket and unbutton one or two buttons. Turn the pillow cover right side out and poke the corners into shape. Press the cover to remove any wrinkles. Unbutton the rest of the buttons, then slide the pillow inside. Rebutton the pillow cover and your new pillow is finished! Want to spruce up your shirt pillow cover? Use a different fabric for the back (you could even use two shirts to make two reversible pillows!). Make a pocket square for the pocket.